When the genre you love becomes a trope, and the politics you believe in make your voice less relevant, how do you express yourself? 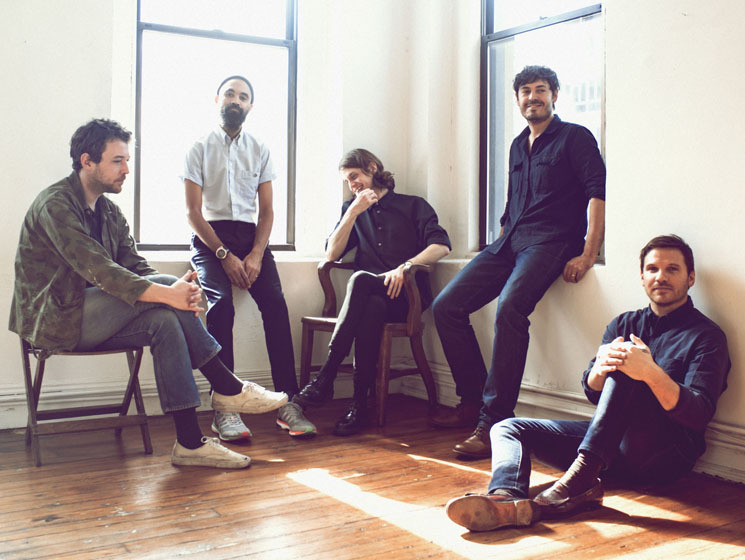 Fleet Foxes founder Robin Pecknold recently answered a question about the folk genre on Reddit thusly: "I feel like there was a period from 2012 to 2016 where it would have been very culturally exhausting to release a 'folk'-sounding album, considering the climate of Mumford and Sons and the Lumineers being so incredibly popular. What were we to do? Try and be as popular as them and change the music? Switch genres in reaction to that zeitgeist, which would be sacrificing my tastes just for the purpose of Othering ourselves from them? I didn't want to be working from a place of reaction but from a place of action and that was just impossible to do in those years, considering what Fleet Foxes had come to mean and what had happened after." Fleet Foxes' new record, Crack-Up, balances a familiar folkiness with progressive arrangements, and includes some timely socio-political themes. Pecknold is aware that the straight white male folk singer has become redundant, but his version of honesty means honouring his tastes and pursuing his passions. For a time, though, that meant putting Fleet Foxes aside. In 2006, Robin Pecknold started Fleet Foxes with school friend Skyler Skjelset. They attracted producer Phil Ek, signed to Sub Pop, and recruited local musicians Christian Wargo and Josh Tillman into their ranks. By the end of 2008, their full-length debut was being widely praised for its uniquely beautiful sound. Fleet Foxes hit some snags shortly thereafter, including the end of Pecknold's five-year romantic relationship and some scrapped demos. Pecknold struggled to write something more meaningful than what he would later describe as the "pure RPG fantasy" of the first album. They persisted, recruiting multi-instrumentalist Morgan Henderson. Finally, in 2011, Helplessness Blues expanded their already lush sound and mined Pecknold's breakup and existential angst for lyrical fuel. Accolades flew in, but within the year Josh Tillman had left the band and begun his druggy, ironic trip as Father John Misty. By 2012, the indie folk resurgence spawned by Fleet Foxes and Bon Iver had resulted in a specific archetype for the genre— the bearded, straight white man in a forest with his feelings. Mumford and Sons' Babel and the Lumineers' self-titled debut turned indie folk's aesthetic toward poppier aims, while Father John Misty's Fear Fun countered with humour and self-reflexivity. In the meantime, Pecknold kept busy with other endeavours. He scored a documentary and an off-Broadway play, and enrolled as a student at Columbia University in New York. Instead of arbitrarily deciding to write different music or creating a persona, Pecknold took a more earnest approach, taking the time to develop as a person and experience life outside his band. Pecknold is quick to distance himself from any thematic connection between, say, Helplessness Blues' closer "Grown Ocean" and Crack-Up's opener "I Am All That I Need / Arroyo Seco / Thumbprint Scar." "I think part of why I took so long to make another record was that I didn't want to make another that had the same outlook as Helplessness Blues, but I stayed in that mindset for a really long time. If anything, I became more content than the existentialism or whatever that album was about. I wanted it to feel less sung to the audience and more like a scene from a movie the audience was watching." Pecknold wrote online recently that "the straight white male is the last voice of 'cultural relevance' that I'm actively looking to, or sympathetic to, in this particular cultural moment" and that therefore, "presuming to have something genuinely important to add is arguably an invocation of privilege." Instead, Pecknold sought to make a useful "balm" for those who were receptive. However, he did not avoid politicized events: "Cassius,- " is about participating in protests following the murders of Alton Sterling and Philando Castile last summer, as well as the death of Muhammad Ali. When asked about balancing his privilege with a desire to comment, Pecknold says, "I guess the perspective in that song is that of a participant, and a sympathetic observer, and a questioner. The lyrics 'I walked home, no words to say' are just saying I don't have any value judgements to make. It's just a depiction of events that I participated in. 'Cassius one month gone on his way'— Muhammad Ali had died a month prior, and I feel like he was a cultural leader and a hero, and so the void left by his death at that time was palpable, I felt. So that's why that comes up in the song. 'Who will lead us and who remains to die' — the election was ongoing and it wasn't clear who was gonna be president. 'Drop my head to cry' — just saying that is as much of an answer or statement as that song gives about those events. I'm explaining it like this because I feel like [saying that much] is completely within my right to write or depict that. I'm not overstepping, I'm not like Macklemore saying 'black lives matter,' I'm not trying to co-opt something that doesn't belong to me. I'm not trying to sing a song that isn't mine to sing, but I can at least comment as a sympathetic observer." On the eve of Crack-Up's release, Pecknold says he is "excited for the record to come out and pretty at peace with however it does." "I think my goal for the record was I wanted it to feel like a conversation with a listener, where by the end of it you're sort of convinced that the next album after this one can be whatever you want it to be, and that there aren't as many stylistic rules. I wanted to do that in a graceful way and make kind of final statements on certain types of songs on this one." Wherever he goes next, he's done an admirable job of navigating the issues facing an artist of his nature in this unique cultural context. Watch Fleet Foxes' Short Film for "If You Need To, Keep Time on Me"